ClickBank is an Internet affiliate network which combine thousands of Internet affiliate programs into one simple website. So instead of signing up for numerous affiliate programs, which can be a hassle, you only need to sign up once with a site like ClickBank. 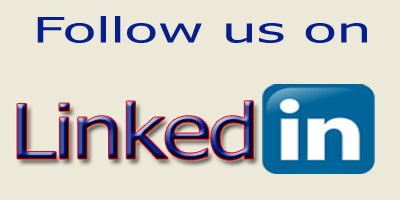 This will allow you access to promote over 11,000+ products and services. It’s free to join and there are no obligations. Once you pick a product that you want to promote, it is super easy to get the special link you need to promote the products and earn commissions with. I will show you how a little later. 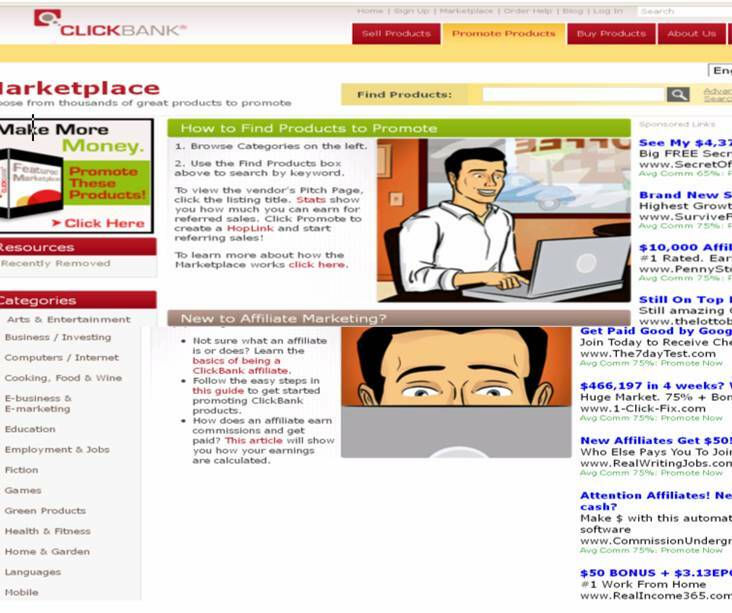 ClickBank located at http://www.clickbank.com connects over one hundred thousand affiliate marketers with thousands of “Information- Products” and product vendors. Information Products like the one you are reading right now. But they can also come in the form of an e-book, audio teleconference, software, anything that comes in digital form-not physical form. 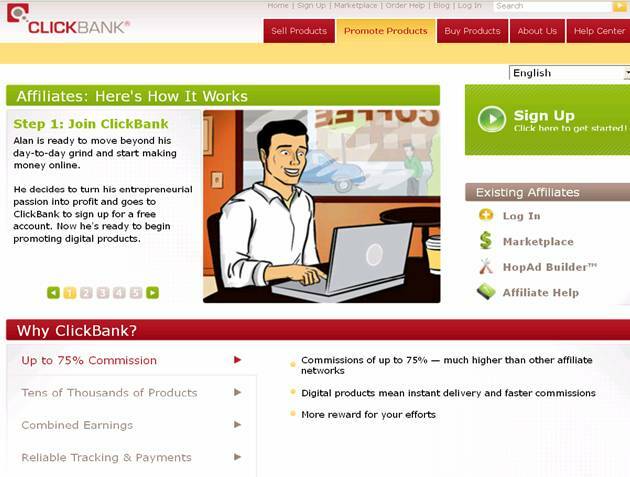 What you do is, sign up to Clickbank get a free affiliate account and look for products to promote. When you make a sale the commission is credited to your account and checks are sent out every two weeks. But why ClickBank? I choose Clickbank because you get a large commission on sales, Clickbank specializes in information products, and the product vendors only pays a small fee, thus a larger commission can come our way. As much as 50-75 % which is much more than other networks such as Commission Junction and Linkshare which pay as low as 5%. These are the reasons why most of our strategies will be focused on ClickBank affiliates. For the next few weeks or months you will be visiting the Clickbank Marketplace over and over again. ClickBank list all the products currently being sold by their vendors, and the affiliate can browse through and choose a product to promote. There is no need to apply to promote the products, you just enter your ClickBank NickName and get started. I would like to express the point here that you do not have to limit yourself to Clickbank. 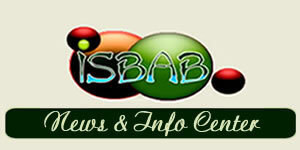 You should explore options other than ClickBank such as commission junction and link share. So, before we go any further run over to http://www.clickbank.com and register yourself as an affiliate, you will also be asked to provide a nick name for your hop link, so have one ready, and whatever you do don’t forget it. Then get back with me. After you have registered with Clickbank the fun begins. You can now browse through the product categories and search for a specific products to promote. You can browse through the product categories at ClaikBank or search a specific product or keyword. You may want to click on the “ Fun and Entertainment” category to browse through all the products in that sector, or search for all the products with the keyword ”gambling” in their description. Clickbank products are arranged by Popularity and Gravity. 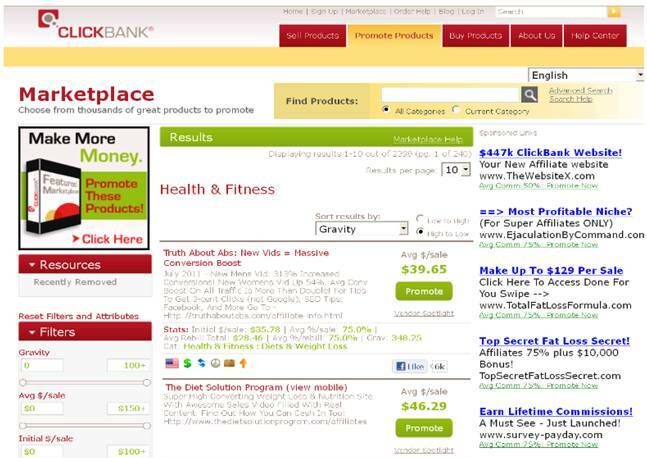 Here is an example of a page on the ClickBank marketplace where the products are arranged in the order of gravity. Also note that the headlines and factors are listed for you to view. Just click on the product TITLE and decide if you want to promote that product or not. The above factors can be seen below the product Title in green writing. So for now just make a note of each of these factors because we will be using them later on in the guide. This is how it works, you sign up to ClickBank, get a free affiliate account and look for products which you would like to promote. When you get a sale, your account is credited with your affiliate commission. The category is irrelevant, up to now all of the categories which we have used have affiliate products with excellent profit potential. After you click a category you will be taken to a page with the top ten selling products for that particular category. You can be sure that the products ranked in the top ten are good selling product. I suggest that for your first test product choosing one with a ranking of 40 or better in its particular category and having a gravity of at least 100. If you are in a sub category, tighten it up a bit and choose only from the top 10 also with a gravity of at least 100 on up to the highest. This way you can be sure that the product you will be marketing has a proven track record in sales, giving you a better chance to succeed. But remember always check the vendors sales copy before promtion any product. Use the criteria tat I give you in my book, and always make sure that the products you choose give you a 40% commission or better. Never market products with commissions under 40% and a pay out of at least $30 unless you find a product that you feel will sell like crazy and make up for the low commission percentage. Most of the products on ClickBank will give you a nice 50% commission, which is very good. So make sure that when you are choosing products to market, they pays you 40% or better. $/sale: how much affiliates have earned per sale in the past. %/sale: how much your percentage is in accordance to the price of the product 50% is normal 75% is a greater percentage. Gravity: how popular the product is--how many affiliates have sold the product recently, not a real number, a gravity of 50 does not mean that 50 affiliates have sold the product, it only tells how popular the product is. The higher the gravity the more popular the product.